At least 11 candidates are set to run in the French presidential election. As the deadline for registration passed, anti-globalisation farmer Jose Bove said he was not sure if he had enough signatures to become the 12th. At least 500 signatures from elected officials are needed to run in the first round on 22 April. More than 20 politicians have been campaigning in the race. 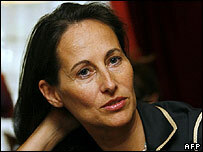 Centre-right leader Nicolas Sarkozy and Socialist leader Segolene Royal are frontrunners. A record 16 candidates were on the ballot in the last election, in 2002. 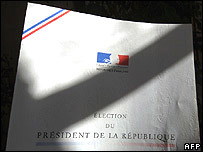 There is no problem for candidates of parties with many elected officials, like Mr Sarkozy of the ruling centre-right UMP, Ms Royal of the Socialist Party, Francois Bayrou of the centrist UDF, or Marie-George Buffet, head of the Communist Party. Others, like Jean-Marie Le Pen, head of the far-right National Front, or Olivier Besancenot of the Communist Revolutionary League, have been struggling to collect the necessary endorsements. Many small-town mayors do not want their names to be associated with candidates of the extreme right, or the extreme left. Both Mr Le Pen and Mr Besancenot have called the current system "undemocratic". The Constitutional Council will now start checking all the signatures. Then it will compile the list of candidates, to be printed on all ballots for the first round. A second round of voting is almost certain to be needed, as no candidate is likely to win an outright majority in the first round. Opinion polls show centrist candidate Mr Bayrou catching up with Mr Sarkozy and Ms Royal. Pressure on Ms Royal has increased, with a book written by a former top Socialist economic adviser accusing her of incompetence and arrogance. "Segolene Royal should not become president of the republic," Eric Besson wrote in a book quoted by French newspapers. Mr Sarkozy has also suffered a setback, with his ministerial colleague Azouz Begag announcing his support for Mr Bayrou. Mr Begag, who is equal opportunities minister and of Algerian descent, called Mr Sarkozy's proposal for a ministry for immigration and national identity "indecent".